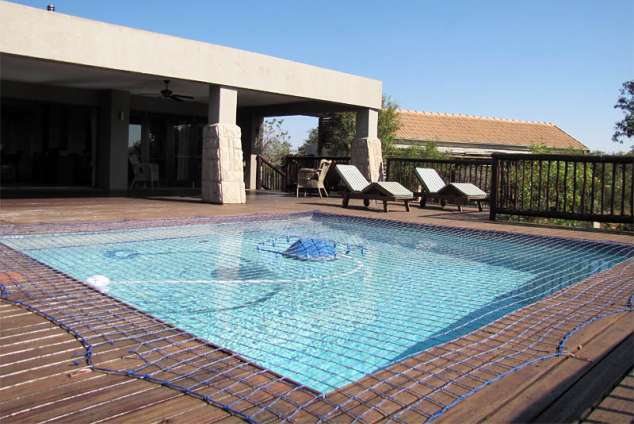 Lodge 303 Elements Private Golf Reserve - Bela-Bela Accommodation. A luxury 4 bedroom (all en-suite) lodge located at Elements Private Golf Resort. All rooms are air-conditioned with stunning views over the Waterberg Reserve. Rooms come with all amenities and have en-suite bathrooms all with a shower and bath, including separate toilet. Each unit also has a private outdoor shower. There are two rooms with Queen beds and two rooms with two single beds which are on a sliding headboard so they can be pushed together. Rooms also have lockable inter-leading doors. The rooms are set slightly away from the main lounge/dining area ensuring privacy. The lodge comes with full linen including towels. The lodge includes a lounge with air-conditioning and includes a LCD TV with DSTV (Bring Card). Dining area has an 8 seater dining room table. Kitchen comes with all appliances, including an ice maker. Scullery has both a dish washer and washing machine/tumble dryer. Large covered wooden deck with built-in braai facility and 8 seater outside dining table. Private pool is set on a large wooden deck with views over the mountains. There are 4 sun lounges available for relaxing around the pool area. There is also a private boma area with seating for 12 where you can enjoy those evening fires. Elements is located 2 hours from Johannesburg in the beautiful Bushveld region of the Limpopo Province. Set in a wildlife sanctuary surrounded by bushveld and majestic mountains, Elements Private Golf Reserve incorporates an 18-hole Peter Matkovich designed US PGA Championship Golf Course. The natural game species resident to Elements Private Golf Reserve include: Kudu, Impala, Blue Wildebeest, Zebra, Blesbok, Red Haartebeest and Mountain Reedbuck, as well as smaller indigenous species which roam the estate freely. The estate also has its own restaurant and bar area for your use. There is also a tennis court available for your enjoyment. Take N1 to Polokwane from Pretoria. Take Bela Bela off-ramp and go into middle of town. Turn right just past Forever Resorts entrance towards Elements. Continue on the road until it becomes a dirt road. Travel for a further 6 kms and take first available left onto another dirt road - sign showing Elements. Resort is further 5 kms along this dirt road. 39854 page views since 09 Oct, 2009.